Before we move too much further in our travels, I’d like to reflect a bit more back on India. The view from our hotel room in the creepy hotel. As I’m sitting in the pitch dark in our hotel room in probably the creepiest hotel I’ve ever been in somewhere 30 km from Munnar, India, let me recap a little about our trip to Kerala so far. 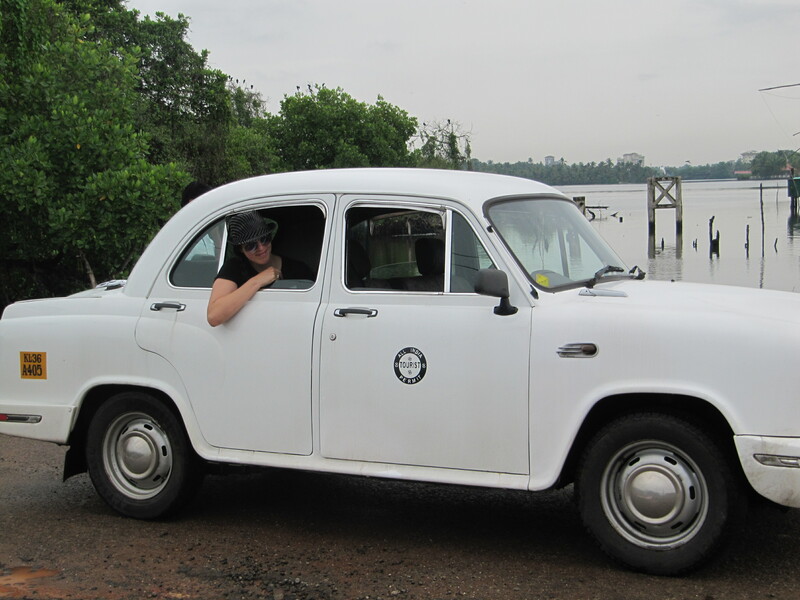 We arrived at the Kochi airport, and through a very brief email exchange, arranged for a taxi to pick us up from the terminal. I was told that the driver would be waiting with my name on a sign. Outside the airport, we immediately saw a short man with a piece of paper that read ‘MR. MICHELLE’ and, since there didn’t seem to be any other Mr. Michelle’s around, we took the ride. After almost 2 hours in a speeding cab though the dense, colorful city, we arrived in what seemed like the middle of nowhere at a very nice and comfortable hotel called the Vintage Inn. The word ‘quaint’ was invented for this sort of place. 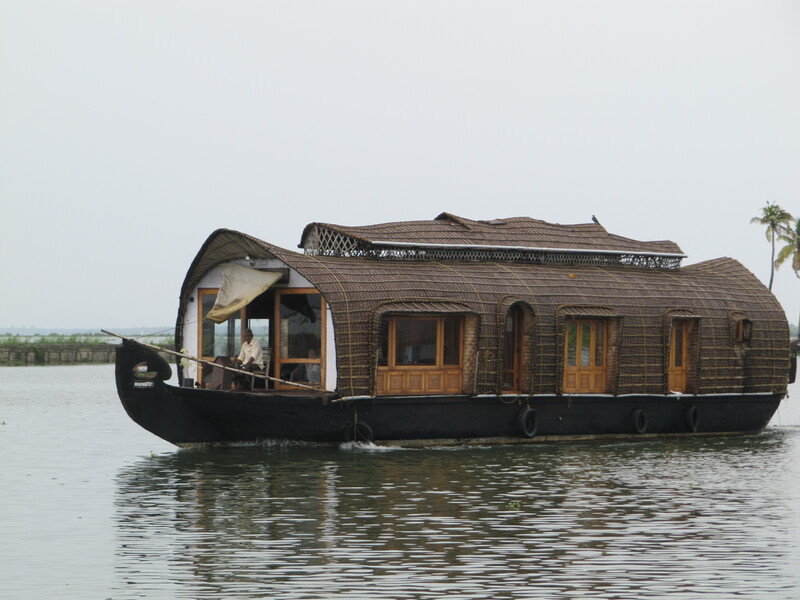 We heard about these cool houseboats where you can cruise overnight out on the Kerala backwaters from a town called Appeley, and we wanted to book one for the next day. The arrangements we tried to book online fell through, so we set out to town to book ourselves a houseboat. A short walk brought us to ‘town,’ if you could call it as such, this town was a few streets with about 3 restaurants and a handful of shops with no streetlights whatsoever, and on our walk over there it started pouring rain. We found a dark, dingy tourist office and were able to book a houseboat for the next day and a driver to take us around the area. He was to pick us up the next morning from the Vintage Inn. – Hey, Clive, errr, Cedric… I hear there is a Fort around here, can we swing that? Fort Kochi? – Yes, yes, Fort, yes. – Hey Cletus, are we going to the Fort? – Yes, yes, we’ll see some very nice scenery, good view..
We turned down a narrow muddy road by the river, ‘Chinese fishing nets, good view,’ Cletus pointed out and drove up us to a canal that did, indeed have some boats with very old looking fishing nets hanging from tall V-shaped poles. No tourists around. The next random stop was at a liquor store on the side of the highway, where dozens of Indian men waited to buy booze through a cage at the front. Cletus brought us in through the back door. There were boxes everywhere piled up to the ceiling, and barely a one-person wide path through. We made our way in and bought a bottle of rum and several local beers called ‘Strong Beer.’ And then we were off to Appeley to find our houseboat. I never did see that fort. A typical houseboat. They have anywhere from 2-5 bedrooms. After some fruitless haggling with the tour operator on the price of our houseboat, we were taken down a very muddy dirt road over the river and boarded the boat. There was a captain, a cook, and the two of us on the boat. The two crew guys were super nice and accommodating. We set out on the river, which is a series of big and little rivers and inlets around a main lake. Dozens of houseboats just like ours were motoring around, carrying families, couples, and often, big groups of young men who appeared to be on a bachelor party. I loved cruising along the river and gazing out of the boat. The views were so beautiful and serene. I could sit all day on that boat and just watch life pass by. People on the Kerala backwaters live half in the water it seems, everyone gets around by little boats rather than cars. They live on strips of land out in the middle of the water that are no wider than a house and little yard, with river on both sides. 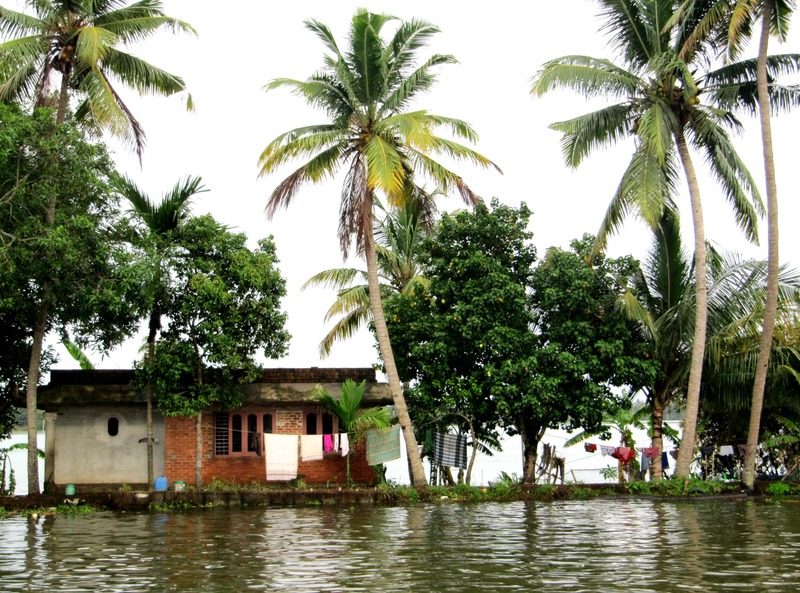 A typical house on the backwaters — on a small strip of land with water on both sides. From the houseboat, you have a front-row seat to 1,000 real-life stories moving slowly by. 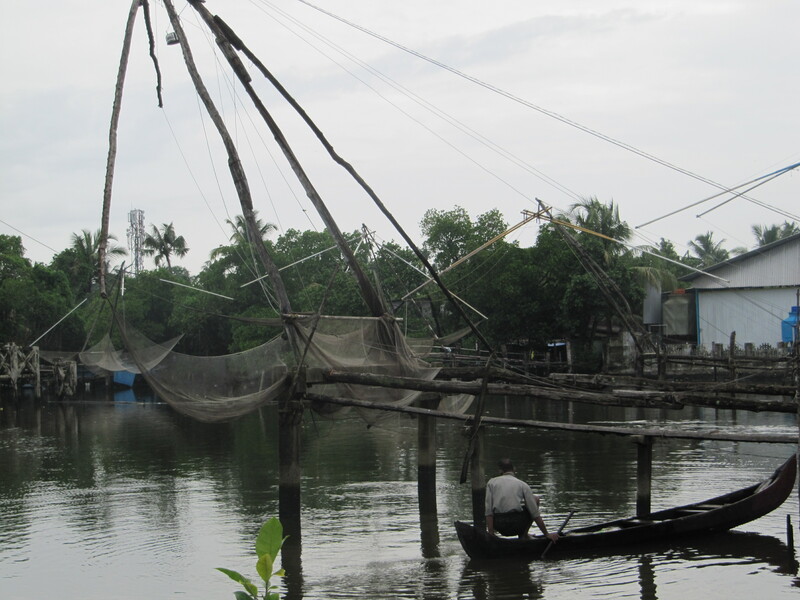 As we cruised around I caught little glimpses of daily life on the backwater: a man teaching a very young boy how to fish, ladies gossiping and laughing loudly while doing laundry, a man giving his dog a bath in the river, fishermen pulling up their nets to examine the day’s catch. 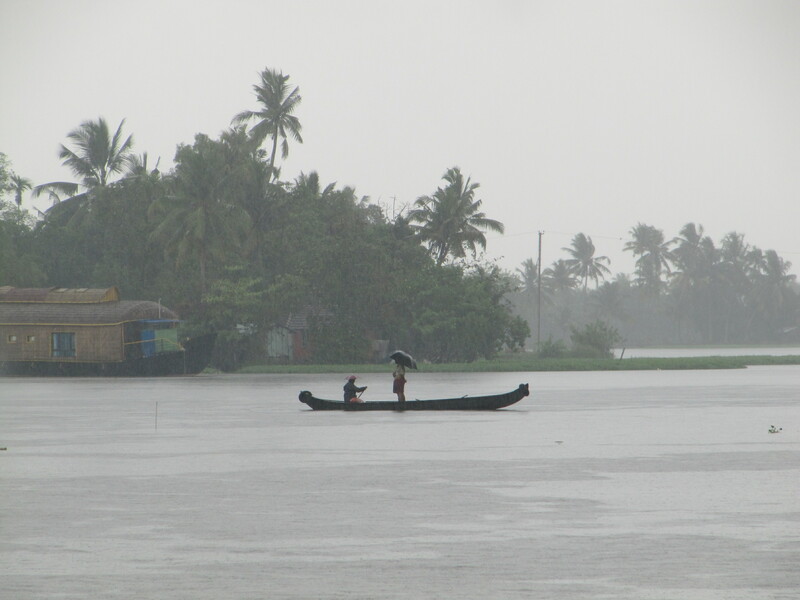 A scene on the backwaters. The food on the boat was amazing and fresh. Whole fish, curries, fried mango, snacks, veggies, rice… I don’t even remember it all but it was fantastic. The boat was parked on the side of one of the pieces of land after sunset for us to sleep for the night. Cletus picked us up from the houseboat the next morning and we began the long, swerving ascent through Eucalyptus forests and tea plantation fields to Munnar. Or so we thought. 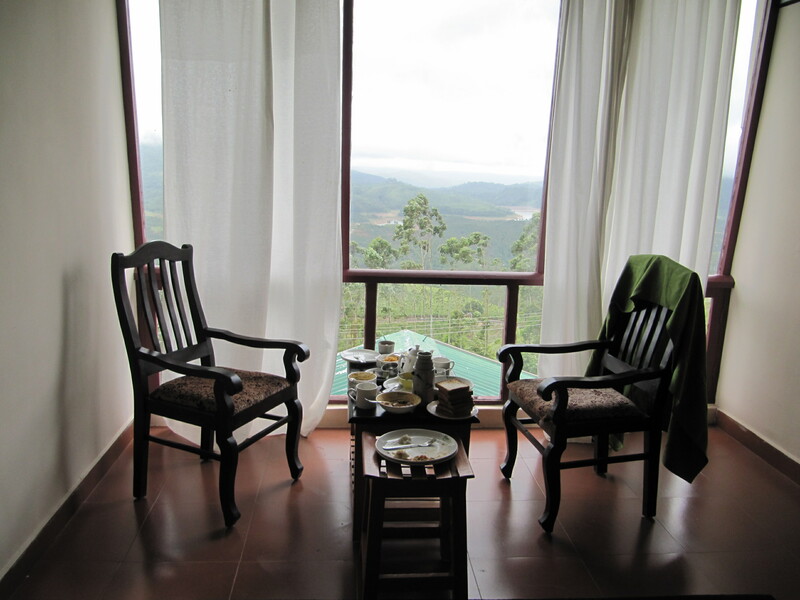 The hotel was actually about another hour further into the mountains than Munnar. When we arrived it was almost dark, too dark to go back down the steep driveway and to the nearest town to get dinner. The only man who spoke English asked us over the phone what we wanted for dinner. A bit confused, I asked if we could see the menu. A menu there was not. He started rattling off a bunch of very random food choices, and seemed to be trying to cater to what American’s might like. “You want French fries? Mashed potatoes? Chicken? Salad?” In the end I had no idea what we ordered. Dinner consisted of: a plate of cucumbers, tomatoes and carrots, chicken biryani that tasted mysteriously like Bazooka Joe bubble gum, a bowl of mashed potatoes, onions in raita, a side of ketchup and India ‘pickles,’ which is usually some sort of sweet green pepper pickled in an intensely flavored red sauce. It was one of the weirdest dinners I’ve ever had. The huge dining hall was totally empty except for us. There were cobwebs on the chandeliers, faded wallpaper and stained placemats. Several references to ‘The Shining’ have been made since we’ve been up here. This resort is at something like 8800 km in elevation, and since it’s the beginning of monsoon season. The wind is raging wildly through the trees around us. I’ve never heard wind so loud. At one point I was sure it was pouring rain, and thought I heard thunder, but in both cases it was just the wind howling through the leaves and knocking things around outside. It sounds like an epic battle between good and evil is raging right above our little bungalow. I hope the winner is decided before morning. Glad the driver’s name wasn’t Prabaker! I love reading these articles because they’re short but inrimfatove. I’m extremely inspired with your writing skills as smartly as with the structure in your weblog. side of the story. I can’t believe you aren’t more popular because you definitely have the gift. It’s really very complex in this active life to listen news on TV, thus I simply use world wide web for that reason, and take the latest information. or give me more business in the first place. Hi to every one, since I am really keen of reading this webpage’s post to be updated daily. Appreciate yor sharing this one. A must read post!